SG Hospitality - OCBC Investment 2018-03-09: Ma’am, Where Would You Like To Extend Your Stay? We’ve picked the good deals for you! But note risk of rate tsunami. For the counters we cover, y-o-y growth in 4Q17 Hotel RevPAR ranged between -2.4% to 2.3% while 4Q Serviced Residences RevPAU increased 5.7% y-o-y for Ascott Residence Trust’s (ART) SG-based SR portfolios and dropped 5.5% y-o-y for Far East Hospitality Trust (FEHT). On the whole, FY17 DPU growth ranged from -14.3% to 11.5% YoY while 4Q17 DPU ranged from -13.4% to 0.0%. Given the improving supply-demand dynamics, we are optimistic about RevPAR growth in 2018, especially the second half. Based on feedback from REITs as well as our channel checks, we expect low to mid-single digit RevPAR growth for 1Q18. Our 29 Jan 2018 SELL call on the CDL Hospitality Trusts (CDLHT) (see report: CDL Hospitality Trusts - A Look At Risk-reward) happened to coincide with the sell-off in REITs a few days later, and was thus very well-timed in retrospect. CDLHT posted a - 7.3% total return till its 12 Feb close, after which we upgraded it to HOLD (see report: CDL Hospitality Trusts - Unit Prices More Reasonable). In comparison, Far East Hospitality Trust (FEHT)’s unit price has posted a resilient 1.4% in total returns since we upgraded it to BUY on 12 Jan 2018 (see report: Far East Hospitality Trust - The Catalyst We Needed), relative to the -5.5% total return in the FSTREI over the same period. We decided to downgrade OUE Hospitality Trust (OUEHT) from Buy to HOLD on 2 Nov 2018 (see report: OUE Hospitality Trust - Strong RevPAR Growth Continues) – at that time, it had posted total returns of 28.0% since our Buy call, beating the FSTREI by 10.8 ppt over the same period. As of 8 Mar 2018 close, its unit price is up 5.5% from the time of the downgrade. We have maintained a HOLD rating on Ascott Residence Trust (ART) since 25 Jan 2017 (see report: Ascott Residence Trust - Diversified hospitality play), and the REIT has posted a 12.3% total return since then till the 8 Mar 2018 close. Some “rooms” are still on discount! Going forward, there are two things for investors to note when looking at the sector. First, we believe operational upside has largely been priced in for the hospitality REITs under our coverage. We still find yield spreads unattractive despite the 6.1% correction in the FSTREI since the start of Feb till 8 Mar’s close. Hospitality REITs under our coverage are currently trading at FY18F dividend yields of 5.8% to 6.2%. Should there be any upside surprise, we believe it would likely come from FEHT which underperformed in FY17 and stands to benefit the most from a strengthening in corporate demand. Second, we expect that the unit price movement for the hospitality REITs will likely be dominated by fund flows into or out of the SREITs space in the next few months, rather than by sub-sector specific factors, as the focus turns to the pace of interest rate hikes. We recognize that REITs remain vulnerable to the dynamic interest rate environment and suggest focusing on names with clearer value propositions at this price point. 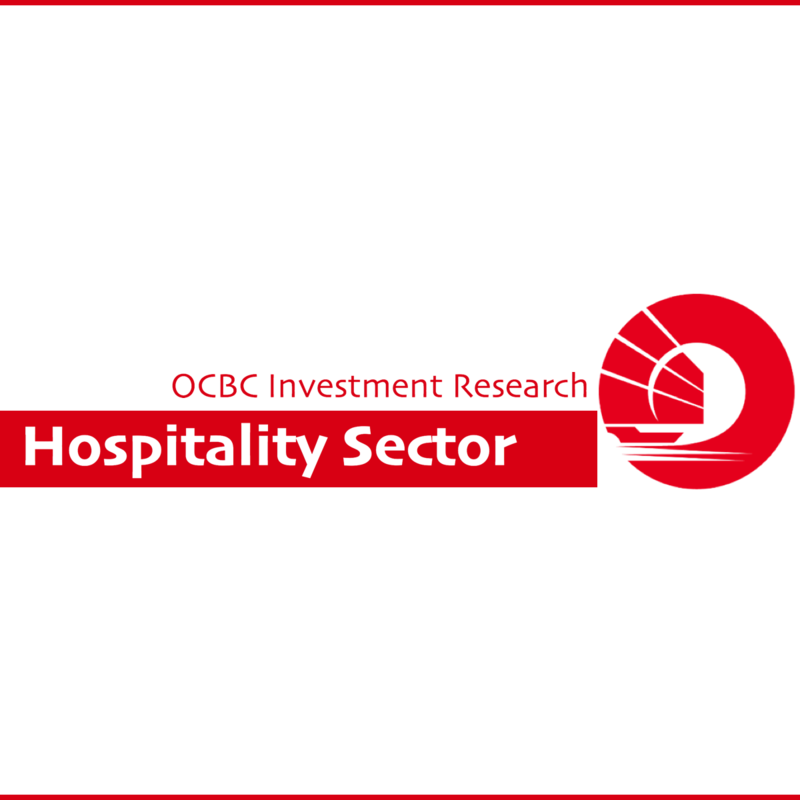 Far East Hospitality Trust [Rating: BUY; Fair Value: S$0.75] remains our favoured pick within the sector. In addition, we continue to like Hotel Properties Limited [Rating: BUY; Fair Value: S$4.74], which we see as a neglected proxy to a stronger hospitality market worldwide. Maintain NEUTRAL. OUE Hospitality Trust (OUEHT) posted the greatest RevPAR growth, while Far East Hospitality Trust (FEHT) faced a challenging four quarters in 2017. Going forward, we believe FEHT will have the easiest time outperforming the benchmark it set last year and stands to benefit from the recovery of the hospitality market as a pure-play Singapore REIT. Beyond its recent acquisitions in New York and Germany, as well as its divestments in Japan and China, the REIT is expected to continue to benefit from its efforts in strategic asset recycling. ART’s geographically diversified portfolio helps to minimize the effects of country-specific events and conditions, while its longer-term stays in its serviced residences make it less operationally volatile relative to other hotel-owning REITs. Going forward, the full-year contributions from the Lowry Hotel and Pullman Hotel Munich are projected to bolster CDLHT’s DPU growth in FY18. Beyond its exposure to the recovering Singapore market, we like CDLHT’s exposure to a few faster-growing geographies such as New Zealand. We continue to see 2018 as a period of recovery from the low base in 2017, given the better supply-demand situation this year, though we note that there may be some overhang form the backend-loaded supply injection in 4Q17. For the serviced residences, we believe 1Q18 should see a marked improvement y-o-y – recall that FEHT’s SR suffered a 13.1 ppt drop in occupancy to 71.2% in 1Q17. The SR occupancy has since recovered to 78.2% as at 4Q17. We are also positive on the acquisition of Oasia Hotel Downtown (OHD), which is expected to complete in April. Going forward, we expect OUEHT to benefit from the expected recovery in the hospitality industry, though we do note the fall-off in income support from CPCA from 4Q17 onwards. Looking ahead to the next two to four years, we continue to anticipate increased traffic at CPCA after the recent opening of Terminal 4. In 2017, AOR, ARR, and RevPAR grew by +1.5 ppt, -3.3% and -1.5% YoY respectively. This compares to the 4.7% and 5.3% declines in RevPAR for the whole of 2016 and 2015, respectively. For 2017, key data points for 2017 were the 4.5% increase in room supply and the 4.6% increase in visitor days (on the back of a 6.2% increase in tourist arrivals), and 3.6% increase in Singapore GDP. RevPARs are expected to improve in 2018 with better supply-demand dynamics, though we expect slightly weaker RevPAR/RevPAUs growth (low single-digit) for 1Q18 given the back-end loaded supply injection in 2017. For 2018, key data to note are the 1.2% projected increase in hotel room supply, the mid-single digit growth in visitor days we expect, and the official forecast of 1.5% to 3.5% growth in Singapore GDP. According to hotel tiers, the RevPAR increase was most significant for the Economy hotels in 2017 (+8.4% y-o-y). 2017 RevPAR for luxury hotels fell 2.8% y-o-y, while Upscale and Mid-Tier hotels clocked a +0.1% increase YoY. According to Horwath HTL forecasts (as published in the CDLHT 4Q17 presentation), the total room stock is expected to increase 1.2% in 2018, which in our opinion, will likely be less than the increase in visitor days this year. Should both leisure and corporate demand remain healthy, the relatively muted room pipeline from 2018F to 2020F should put the Singapore hospitality market in a position for a multi-year upswing. From our channel checks, it appears that corporate demand has picked up perceptibly in terms of volume, with more requests for proposals and corporate enquiries for function rooms and activities recorded. We see this as a positive both for REITs with hotels assets catering to businesses, as well as serviced residences, which have had a difficult 2018. Meanwhile, we expect leisure demand to remain healthy, and forecast a mid-single digit growth in visitor days.